Get ready for some of the funniest talking dog and baby videos! Seriously, is there anything cuter? Admit it, you’ve spent quite a bit of time searching YouTube for the most hilarious clips of babies and dogs together. I won’t judge, I’ve done it too! It’s like a double dose of cuteness, right? I’ve rounded up a few of my favorite clips for you to enjoy. 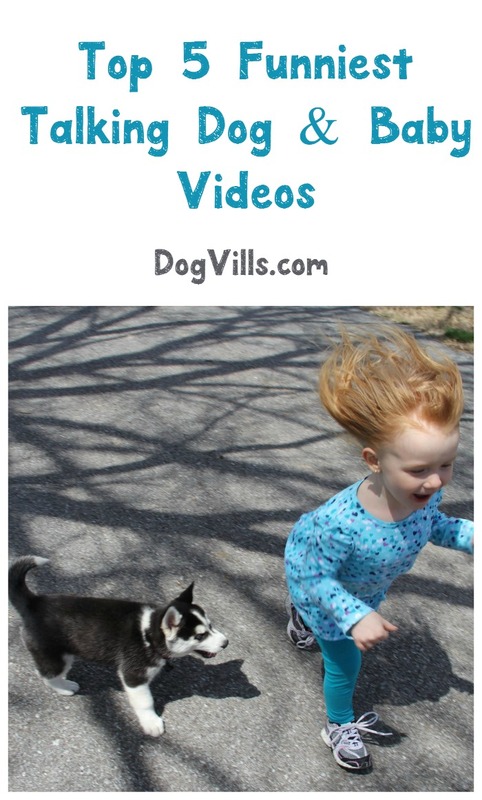 Don’t forget to check out our other talking dog videos, like our pitbull edition and our favorite chatty Huskies for even more laughs! Husky and Baby Talk to Each Other– This amusing video was posted by YouTube user Cute Puppies on December 5, 2012 and to date has received 604,037 views. This video showcases an interesting and entertaining conversation between a talkative baby and his equally talkative dog. What is funny is that the two actually act like they understand what the other is saying. Baby Dog Whisperer– This funny video was posted by YouTube user Shorkie Puppies on November 24, 2011 and to date has received 16,292,513 views. This video features a Shorkie puppy named Wicket and a baby named Sophie. The two seem like the best of friends. While little Sophie crawls around on the carpet, she seems to have a lot to tell her pal Wicket. The funny thing is that Wicket talks right back to her. Husky Calms Crying Baby– This comical video was posted by YouTube user Chantie Sou on July 23, 2014 and to date has received 12,287 views. So, how do you get a baby to stop crying? Just ask Otto, who was only 2 months old when the video was taken. Her furry friend, Clyde the Husky, “sings” to her and she seems mesmerized by the dog and stops crying. Baby and His Chow in Conversation– This witty video was posted by YouTube user Little Princess Coco on February 18, 2009 and to date has received 4,789,393 views. There is nothing like a boy and his dog. BB was 15 months old at the time of the video and he just loved to talk. He even tries to engage in conversation with his canine pal, Coco. Of course, Coco looks like he has no clue what the little boy is saying. Do you have any favorite funny talking dog and baby videos that we missed? Share in the comments!